DONT GO..well what can i say or where to start ...well start with what you pay for food and drink... awful to say the least unless you can stomach chips and chocolate spread for breakfast (most tasty things there)..
drinks well the wine burns your throat and the the spirits replacate petrol. the juices and beer are fine though...the cups dont get washed properly though the kids in the pool have a good time trying..
entertainment...like watching the same 6 children try different clothes on every night...(cant this place afford acts) great with the kiddies for 45 mins same thing every night though. Beware paying for pool view as extra price with tour operators as the hotel charges the same as they say all rooms no different. they seem a different epidemic of mosquito for some reason here...a woman was taken to hospital and put on a drip...i myself was at the hospital and got antibiotics and cream... we had 3 mosquitos in the room we killed them kept the door and screen over tight..put towels under the door slept in the bed with pjs and socks and still got chewed....fleas i think was the culprit as i have had mossy bites before and never anything like this. hot water gets switched off just before dinner as everyone will use it then. i wonder why....stray dogs allowed onto complex ...could be dangerous who knows....cockroaches and the stench of drains was horrible. The all inclusive package was brilliant food was great with so many choices to pick from, a great thing when you have kids. hotel close to many resteraunts and shops bus service to Rhodes easily accessible taxi rank close by. We stayed in the Forum apart hotel with children ranging from 4-11. When we first checked into our room it seemed basic and acceptable,until I walked in the bathroom and found a big clump of some-ones hair underneath the sink. I then went to make sure the sheets were clean only to find one of the single beds had a urine stain on the linen so obviously the room hadent even been cleaned before we went in just a quick tidy round. When we went down for dinner the food didnt seem very healthy but we just put it down to the smell of the drains,the food looked like it was a warm up from dinner time and if you wanted a clean table you had to be one of the first in there. The final straw came for me when we all went down for breakfast and I went to make toast and all of the bread was mouldy! I dont mean little patches of mould I mean big circles of it ,so I would dread to think what the kitchen was like never mind what they did with food that hadnt been eaten from breakfast,dinner and tea. You had to cross one little side road to get to each part of the hotel,and in my opinion it is not safe to let your children walk across at any age ,the cars come flying round the coner and yeah ok thats not the hotels fault but not cutting the trees down so you have to step in the road to see if anything is coming dosnt help. They had a leak from the first floor into the restaraunt and belive it or not they coverd the walk way with clear polystyrene held down with bricks over white tiles,my friends little boy slid on this and split all his chin open. We asked the rep where the nearset 24 hour medical centre was and she didnt know,so they had to go to the main hostpital. The animation team were fantastic with the children and made the entertainment good fun for every one. Luckily enough for us my friend has worked with Going places/My travel for 10 years and she got us moved to a fantastic hotel in Ixia they demanded payment from us first but we stood our ground to refuse as the hotel is unsafe and dirty. My friend is currently sueing the company for false advertisment and the danger it posed to familes including her own son who could not swim for the rest of the week due to the stiches he had in his chin. As you may of guessed we will not go to this hotel again and we belive it has now been withdrawn from all inclusive and a few major tour operators. Change your hotel now if its not too late. This Hotel is rated as a 4* hotel but has never been a 4* in it's life. We took our 3 boys aged 7, 10 & 12 mid August to what was highly recommended by the travel agents. The rooms are good sized family rooms with a small kitchenette area and a mini bar which is stocked with a few drinks every couple of days. There is air conditioning in the rooms which is included in the price in the all inclusive but if you go self catering it is an extra 30 euros per week. There is no air conditioning in the restaurant, the indoor bar areas, reception or anywhere else. The food was absolutely diabolical. There were very little choice, kids meals had to be pre booked and the quality of the food was terrible. Everything looked like mush. The food was repeated every three days and the highlights were liver and onions, liver and sausage, liver with caramalised onions (get my drift!! ), nothing different and everything as cheaply done as possible. The desserts did not change once in two weeks. Needless to say we ate out 9 nights out of 14 after looking in the restaurant!! You can also eat at a restaurant called garibaldi's in trianta as part of the all inclusive but we went and the choice is really poor for the all inclusive guests. We had no problems getting a sunbed around the pools in a morning and did not ever get up before about 7.30 to get one which was a plus. The pools are a great size but the area around the pool is dirty. The only time is was cleaned up was when I complained (twice!!). There was a group of about 50 people who arrived on the second week from finland. Unfortunately, the management allowed them to have a private pool party which resembled a scene which would have been better placed in falaraki. There were condoms under the sunbeds the following morning which again I had to complain about before they were removed and the area cleaned up. There was very little entertainment as none of the entertainment team or the waitresses had been paid for over 3 months so staff had left to find work elsewhere. The rest of the animation team tried their best but there was only 5 of them to cover 2 large hotels 7 days a week. The evening entertainment really was terrible. Alongside this, the hotel did not possess any glasses for drinks, everything came in plastic glasses. This was a good idea for the daytime around the pool but it became a joke at night when everyone was drinking cocktails and bacardi and coke from an ikea beaker!!! The head barman told us the hotel has no money to buy glasses!!! The Thomas Cook rep was Scott who really did try and sort things out for us and everytime we went to him (which was daily), he spoke to the manager but the problem would only resolve for that day i.e cleaning round pools. Would I recommend this hotel to anyone, the answer is no I'm afraid. It could be a fantastic hotel if the little things like air conditioning, quality of food, cleanliness around pool, entertainment were sorted out but it seems the hotel has run out of money to provide a good service. All the little things turn into big issues when there are lots of them an in turn, this spoilt our holiday!! The Forum Beach is listed in the brochure as a 4* hotel, however I believe that this is somewhat overated. The restaurant had poor air conditioning. The food was poor, either pork, veal or lamb and only a limited choice each visit. The hotel caters more for the German market and not at all for the children. If you wanted a childs meal, you had to book it 24 hours in advance. Breakfast - there was hardly any choice, lunches were better than dinners. The bars, even though it stated in the brochure, not all were included in the all inclusive, they were, which was a plus. The pools were clean but you had to get up very early to reserve a sunbed. We never did manage to get near the 3 main pools. The British seemed to be all based in the building across the small road, but we were lucky to have the bridge bar and pool where it was quieter. The entertainment team, however, never came across to this pool to ask if anyone wanted to join in with the games. When we arrived at the hotel our first impressions were excellent! The hotel was clean and tidy and reception staff were helpful! The location was disappionting! We could not go in the sea as it was too rough so had to stay in the hotel. The food was varied and very good. entertainment through the day and night were brilliant! Special thankyou to Mark and Debbie! We would visit the hotel again if it was in a different location. We met a lot of families there who we still keep in touch with. One complaint.........a lot of people thought it was clever to get up in the middle of the night to put towels on the sun loungers so nobody could have them! so we decided to get up about 4a.m and do it before the Germans did-they didnt look too pleased! ha! I would recommend this holiday to families! When we arrived at the resort, my friend and I were dropped of at the Forum Aparthotel, which is not what we had booked. 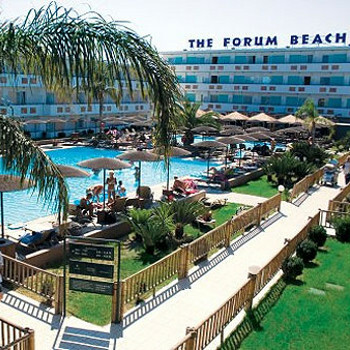 After some lengthy discussions, and heated phone calls, we were moved to the Forum Beach Hotel (the one we had seen in the brochure). On arriving at the Forum Beach we were very pleased with what we saw. The reception and 'Ampitheater bar' are classy to say the least, with marble floors and leather couches throughout. That's not to mention the www.bar.com and the pool bar!!!! Our stay in the Forum Beach was excellent, and as two young lads of 24, had no trouble meeting people of the older age group. As we visited the hotel at the end of the season, the 'Animation Team' was somewhat depleted, with four members in the first week, and three in the second, and so entertainment was limited. Saying this, if you are willing to join in with the entartainment, it is a great laugh, I took part in 'Mr Forum Beach', Karaoke, 'Men Vs Women' and even danced on stage dressed as a woman!!! Thanks to David, Kristof and Helen for that!!! My friend and I both took advantage of the free health treatments on offer, having both a full body massage and a mud treatment each (you have to try everything if it's there). We spent many a night sitting at the bar chatting to the barmen, Theo, Sam, Armando, and who can forget Yani? 'Bravo Yani'. I am hoping to take my young daughter to the hotel next year, as she would love the activities on offer, as well as the fact that I love doing the kids dances! Just make sure which hotel you are booking!!! This hotel has 2 levels of all inclusive, the first is cattle market style food plain and little variety.The second "golden all inclusive" is a different kettle of fish, you can use their beach restaurant which is pretty good where you get a menu and waiter service like normal restaurants which in fact is what it is and the cocktail bar where you can have all the imported drinks and cocktails you could wish for. The hotel has probably 1000 to 1500 guests of which comprise of a 98% mix of french and german and the rest english. The pools are very chemically and irritated our skin so we stayed on the beach which was shingle/sand but we could always get a lounger (which are free for golden all inclusive)but it was quite windy which keeps you cool. The hotel is directly under theflight path of the airport and the planes are probably at a 1000 feet es they pass over, but this didn't spoil are time here infact once we had upgraded to golden all inclusive discovered the beach we had a great time but we do like an univentful/relaxing holiday.